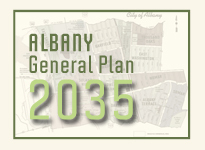 On January 7,2015, the Albany Planning and Zoning Commission held a public hearing on the Draft 2015-2023 Albany Housing Element. At the conclusion of the hearing, the Commission voted 5-0 to recommend City Council adoption of the document, which will guide the City’s housing policies for the next eight years. The Commission also voted to recommend adoption of the Initial Study and Mitigated Negative Declaration, the mandated environmental review document that accompanies the Housing Element. At the January meeting, staff highlighted a number of changes to the document that had been proposed in response to input from Albany’s Diverse Housing Working Group (DHWG). Members of the DHWG provided public comment on the Draft, and the Commission discussed possible edits prior to voting to forward the document to the City Council. The Council will take up the matter on February 2, 2015.